This mod is an amazing addition to any computer. Whether you have never done a mod before, or your computer already has 8 billion lights this mod will look amazing. The Footstep Mod takes a look at a part of the computer that is not usually considered during the modding process. This is the bottom of the system. 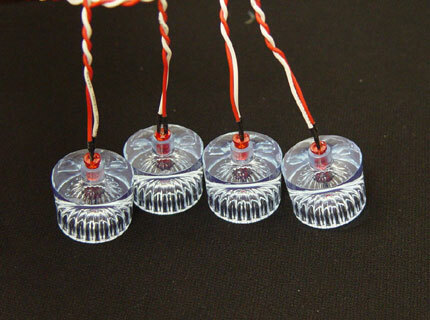 The four LED's that come encased in thick acrylic are designed to act as feet for your computer. They come with double sided tape which neatly fits on both the acrylic and the case. The feet support the case, and at the same time give off a bright glow to the outside of your case. Outside lighting is a great effect to any case mod. Some people chose to do "ground effects" to spruce up the bottom of their system. This is done by adding cathodes to the outside bottom of the case. This effect looks great, and coupled with the Footstep it's simply amazing. *Note: This product is constructed of a light blue clear acrylic, that will light green when the LEDs are powered.